This cake had a lot of phases and the end recipe was sort of, not an accident but it didn’t turn out the way I planned but it did turn out WAAYYYY better. Story time? My mum had been telling me to use the rhubarb for weeks, over the years our plant kind of morphed into 4 plants, it’s sort of like an out of control rebellious teenager but instead of leaving destruction in its path we’re left with rhubarb growing out of our ears. 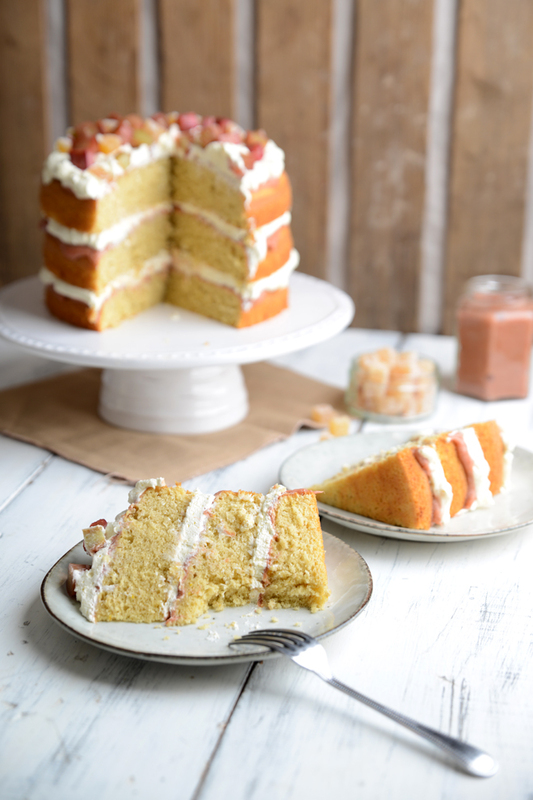 My mum was putting rhubarb in front of every food possible as an idea but like most of my ideas I came up with this one while lying in bed, my mum then reminded me my dad’s birthday was coming up so birthday cake idea sorted. To give you a quick time scale my dad’s birthday is April 23rd and I came up with the idea a few weeks before (apparently this took me two months, whoops!). Anyway my dad’s birthday rolls round and I’m all set to make the cake, my sister wasn’t coming over so I was good to put cream in the cake (she’s a little picky when it comes to cream) but then I had an orange curd disaster that lasted about 3 hours (I kid you not, I honestly wish I was exaggerating) by which point I was so done with this cake and walked out the house leaving the kitchen looking like someone blew up the cake I was supposedly making. I ended up going out to eat with my parents and quickly came up with an idea with my mum to rescue the cake for my dad’s birthday and it was delicious. Life lessons with Waffle & Whisk; JUST WALK AWAY! Okay don’t do that, but sometimes you do have to walk away from a situation to come up with a useful solution. 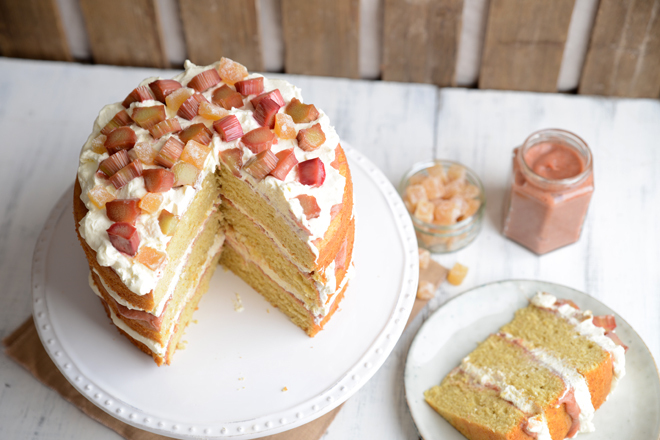 So what was supposed to be me filling this cake with some weird orange-rhubarb-curd-concoction-esque-thing turned into me filling this cake with super-duper-simple-easy-spreadable-rhubarb-compote-type-stuff (points for all kinds of good English). Accidents sometimes (granted usually not most of the time) make baking taste better and this was definitely one of those times. 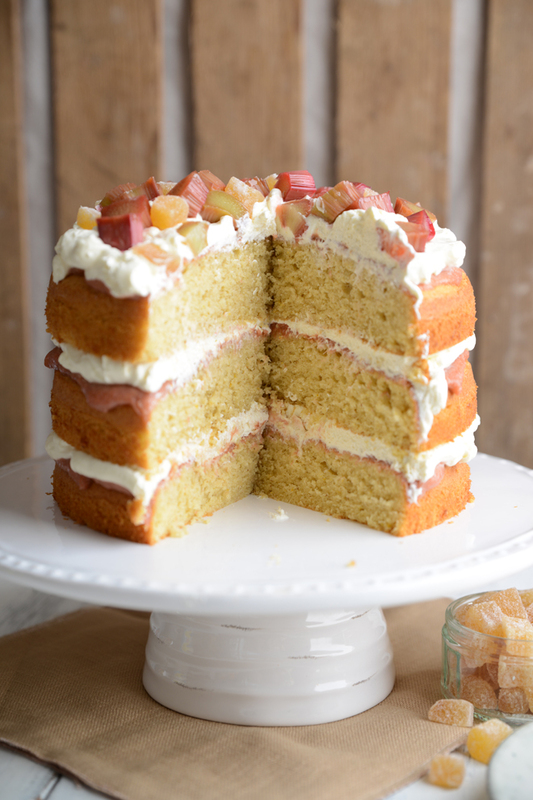 This cake is so fresh; it’s not heavy and has just the right amount of sweetness. Also, I need to mention this candied rhubarb that's on top; I’m kind of obsessed with it. If you have leftover rhubarb just make candied rhubarb ... then proceed to eat the whole bowl, trust me you'll want to. I’m not sure why I’m calling it candied because it’s not crunchy but it is like eating sour sweets, I repeat SOUR SWEETS, and it’s so simple to make. Do not skip this step! 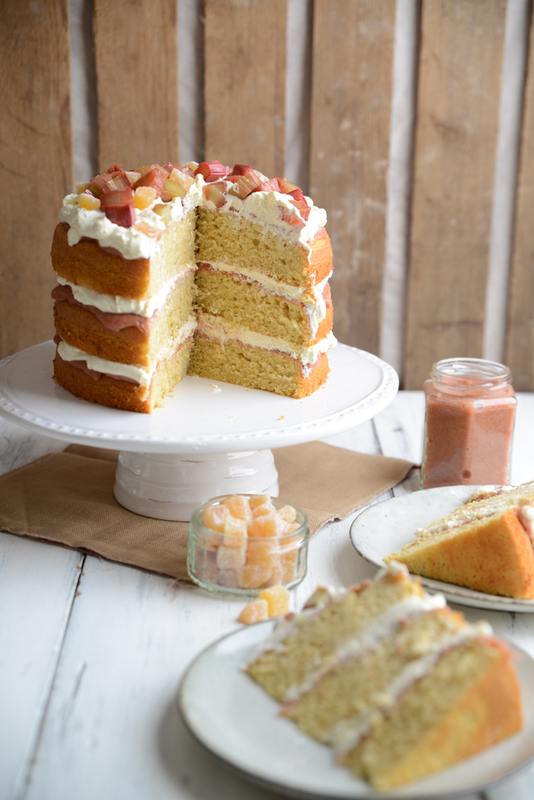 Don't be overwhelmed by how much information is here, this cake is so simple to make. Enough nattering, let's get to the good stuff. First make the cakes by creaming the butter/marg and sugar together until light and fluffy. Add in the rest of the ingredients and mix until you have a smooth batter. Spoon into the cake tins and spread out evenly, bake in a preheated oven for 25 minutes or until an inserted skewer comes out clean and the sponge springs back. Once the cakes are cooked remove from the tin, place on a rack and leave to cool. While the cakes are cooking make the rhubarb filling. Wash the rhubarb then chop into pieces no longer than 1 inch and place in a sauce pan with a splash of water. With the lid on cook on a medium-low heat stirring occasionally, once the rhubarb has softened and mushed down remove the lid and cook on a low heat to boil away the excess liquid until you’re left with a thicker spreadable consistency (keep an eye on it and make sure it doesn’t catch on the bottom) then set aside to cool. Once the cakes have finished cooking and are cooling make the candied rhubarb. Preheat the oven to 110C/200F/Gas mark 1/4 and line a baking tray with greaseproof paper. 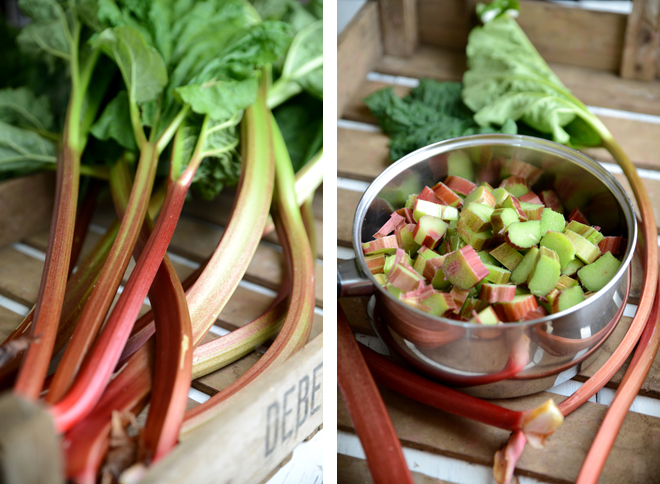 Wash and chop your rhubarb into ½ - 1 inch sticks depending on the thickness of your rhubarb. Put the water and sugar in a small saucepan and heat until all the sugar has dissolved. Dip your rhubarb in the sugar water and place on a baking tray, bake for 45 minutes then set aside to cool. Note: you can make as much rhubarb as wanted until the sugar water runs out. 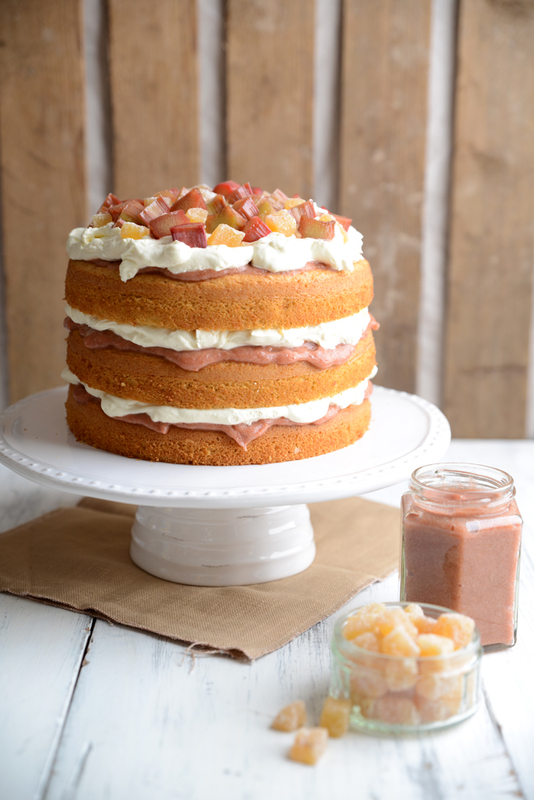 To assemble the cake spread rhubarb compote and whipped cream in between each sponge. On the top layer spread a thin layer of rhubarb compote then top with whipped cream, the candied rhubarb and crystallised ginger. Note: If you only have 2 cake tins and don’t want to cook the third after cooking two, the recipe is easily adaptable to two layers 8 oz of flour, sugar & butter, 4 eggs etc. Yum yum. I have rhubarb in my garden. Definitely going to make this. We are having a bbq this weekend.